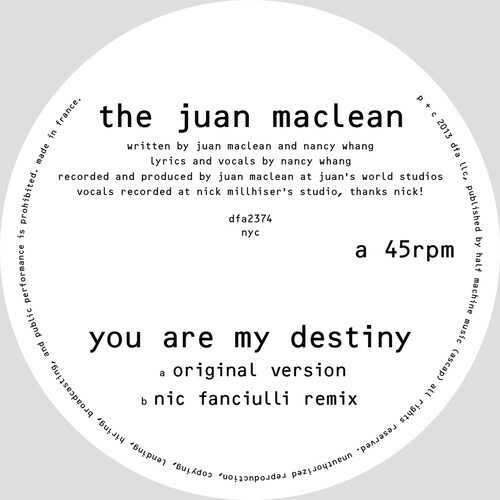 After nearly four years without an official release, John MacLean's solo project The Juan MacLean is back in full force, dropping "You Are My Destiny". Stepping back into the game where he left off, his new release is another ballad, filled with a lengthy build that peaks at his own variation of synth pop. What differs from his older work is that he incorporates varied electronic styles into the song. MacLean fools the listener into thinking the style will keep on its instrumental house root, but when former LCD Soundsystem member Nancy Whang chimes in with her catchy vocals, all of the song's elements work together impeccably, transcending any one specific genre. Featured in this post is the four minute edit of the track, you can listen to the full eight-and-a-half minute version via Vimeo.